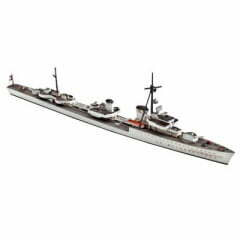 REVELL - Cruzador Z 38 Zerstörer 1936 (Mob) "Narvik Klasse"
The seven destroyers of the "Type 36 A (Mob)" class were built in 1940/41 and went into service with the German Navy until the summer of 1943. These ships with a length of 127 m were very large for a destroyer. They carried 150 mm guns and some were armed with fully automatic anti-aircraft guns. The "Z 38" was used, among other things, for guarding the Tirpitz. 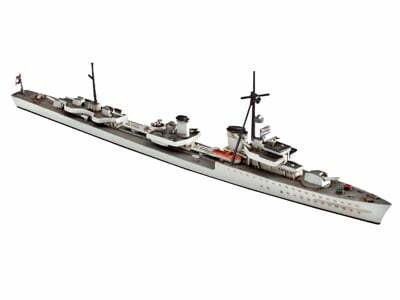 The model can only be built with a water-line hull.